In 1952, Bentley boosted the size of its engine to 4,566 cc in the so-called “big bore, small boot” models. The company also rectified the “small boot” criticism with “R” Type chassis, whose wheelbase remained 10 feet but whose overall length was extended eight inches at the rear, to create a useful trunk space. GM’s four-speed Hydra-matic automatic transmission became available in 1953, and was soon standardized. The new welded box chassis was strengthened by cruciform bracing, central lubrication was standard, and the ride stiffness could be adjusted via a column lever. Standard accessories included a radio, a heater, fitted tools, leather upholstery, and a sunroof. In all 2,320 R Types would be built during the car’s four years of production. Meanwhile in 1951, the prototype Continental was developed, finally to go into production in 1953. The R Type Continental coupe was a throwback to the fast 1930s Bentley tourers, lower and sleeker than the sedans, with a curved windshield and streamlined form, long swooping tail and rear fender skirts. At its introduction, it was the fastest four-seater in the world with a top speed of 120 mph. The 4.5-liter engine would be bumped to 4.9 liters in 1955 and the close-ratio four-speed gearbox could be floor- or column-shift. A total of 208 R-Type Continentals were built, including the prototype. Most were bodied by H.J. Mulliner with five by Park Ward. All but 16 had the distinctive fastback. 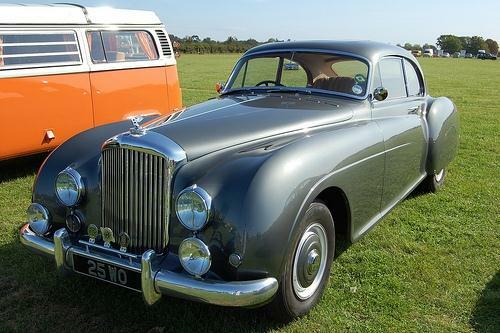 These cars remain the most desirable post-war Bentley and, were replaced by the S-Type Continental in 1955. R-Type Bentleys are reasonably common, quite functional, and extremely elegant, but rust is the big enemy of the Standard Steel bodies. As always, full provenance is essential, with as few owners as possible. Bentley records are quite thorough, which is helpful. Avoid right-hand drive cars, unless they were exported soon after construction, and make sure there is no wedding service in the car’s history, as these cars have generally had trying service lives.